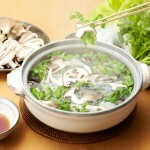 Nabe party of this time is Yamanashi-ken “Houtou Nabe”. 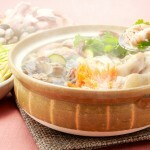 “houtou” is the local nabe,we put udon and vegetables in broth. 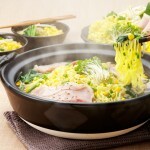 At the restaurants of the towns, it is gaining popularity. There are turrets and pumpkin, the turret adzuki bean. 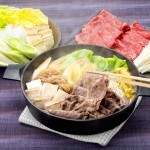 It is said that Takeda Shingen was eating on the battlefield it in the miso stew that puts a variety of vegetables. “Adzuki bean Hoto” as “pumpkin Hoto” means that the food put wheat kneaded. 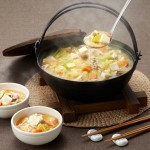 Therefore, it is said that, not called “Hoto pot” The people in the prefecture. “Ken” by other ranking general in the nabe “Best 3 Nabe like” attitude survey by prefecture in private companies. 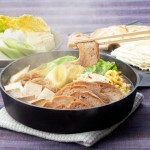 However, it is only Gotochi nabe “Kiritanpo Nabe” was No.1.